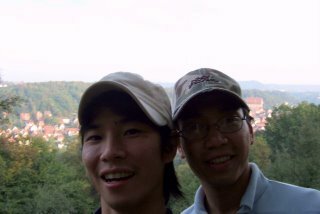 Me and Michael who was stopping by Schwaebisch Hall on his travels along Germany. We hung out for a couple of days and talked about the ups and downs, the sights and sounds, it was cool. I smoked way too many cigarettes and found out Michael has been through a lot of horror accommodations, sleeping one time near a leaky toilet, in a basement and other crazy stories. Well until you meet people who have suffered and still can put on smile than you haven't lived. I took him out to our local club Bartheusa or something like that where they had 1 euro beers and shots til 12.30am......and these shots are like double the size of Australia's pissy little things. As you can imagine we all took advantage of that and enjoyed ourselves thoroughly! A shame I didn't bring my camera, man i feel so touristy...but the pictures are so priceless and soo funny so i think i dun care nmore I am going to shoot everything so World Watch out!!! P.S it seems like I am having so much fun so reality check - most of the time I am spending hours in front of the computer job hunting and learning code. Michael, named after St Michael, comes from Melbourne as well and know some of my friends from back home coincidental, so big surprise! asian community is well connected and he is a physiotherapist, giving good tips on working without damaging my posture. *I need to buy a cushion. * Very easy going and independent, he adjusted really well, as we went to 2 parties and I went to say hello to some of the students, which was great, made friends with strangers as well. NOTE when you travel it is a skill that come in real handy "the ability to engage in interesting conversation with people you would never probably approach." He heads off roundn somewhere, I remember he is stopping by in Japan before coming back to AU.